Mike Galloway does it all—carving, turning, and furniture making—and he gave the presentation at our last woodworking club meeting. 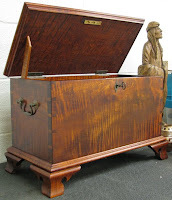 I was particularly interested in the clever ways in which he secures his workpiece while he carves. When working on a small project like his bottle stopper (top photo), he screws it onto the end of a stick. This provides a handle with which to grip the work. 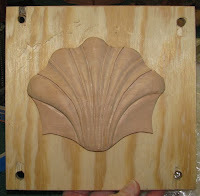 When he carves a larger piece, like an Indian (shown below), he partially screws the bottom of the workpiece to a small board t hat has a large wing nut. He slides the screw between the forked ends of a bendable arm so that the work is on one side of the fork and the board with wingnut is on the other. 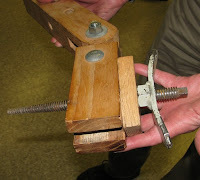 Then he screws it tight and clamps the assembly into his bench vise. For his relief carvings (4th photo)—he uses double-sided carpet tape to fasten the work to a larger board that can be clamped to his benchtop. Since this tape grips so tightly, it can be difficult to remove the project without damaging it. 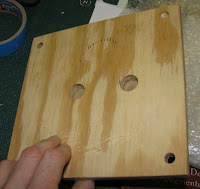 So, Mike drills holes on the opposite side of the backer board and taps the work loose with a dowel. At right and below are photos of some of Mike's finished pieces: tiger maple dovetailed chest, carved Indian, carved bark hobbit house, and two segmented bowls. Thanks, Mike, for sharing some of your tricks of the trade!